THIS SITE IS NOW CLOSED! The Long Room in Queens Park is hosting The Long Weekender over the Carnival Weekend 25th - 27th August. With 20 DJ's playing a wide selection of music from Old Skool, Dub, Reggae, Funk, Hip-Hop, House, Electro, Breaks, Liquid DnB and so on. Nice to see Mark from the Westbury has taken over this site. Maybe now we have the right person for the job. I've been told there is a big carnival weekend taking place there with 20 dj's. I'm so there. Good luck Mark. Yet ANOTHER manager has just taken this bar over. No doubt we'll be subjected to a couple of months of ludicrous 'improvements' while they try to make it their own, only to fail and leave like everone before them has. Can the owners please log in and explain exactly what they are doing that causes manager after manager to leave within a month or two of starting!?! 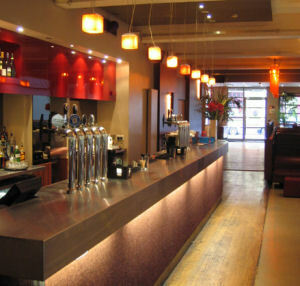 The bar itself looks decent and is in a prime location, with the potential to do so much, if only we could have a period where the manager wasnt working their notice and thus actually cared about what they were doing!